The No. 12 Marquette Golden Eagles (17-3, 6-1 Big East) continue to roll with their sixth straight win, 79-69 over the DePaul Blue Demons (11-7, 3-4 Big East) at Fiserv Forum. Here are my five things to take away from Milwaukee. The evolution of Theo John’s play on both sides of the ball continued as the sophomore finished with a career-high 16 points, 10 rebounds and six blocks. John’s play on defense stood out on a number of other possessions where drives would be second guessed because of his presence. John deferred to the contributions of his teammates, which helped in the win. “Overall, this is one of our best team wins. The point distribution was probably the best it has been in a while, which is people playing unselfishly,” John said. While open looks at the perimeter were few and far between, Markus Howard managed to go to the rim and draw fouls left and right, which resulted in a perfect 15-of-15 from the foul line to finish with 24 points. Free throws were not the only specialty as the junior dished out nine assists to help cancel out eight turnovers. 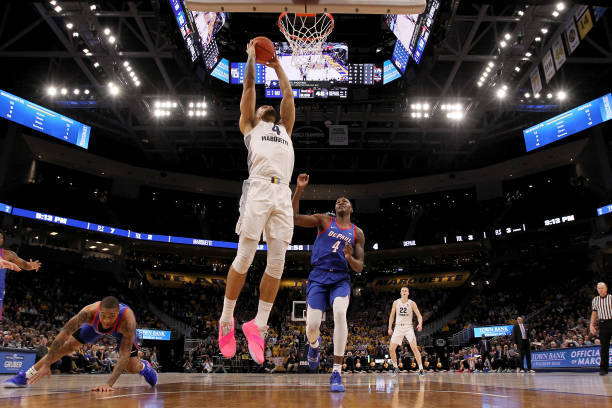 Despite the contributions in other parts of the offense, Golden Eagles coach Steve Wojciechowski knows Howard can improve despite all of the national accolades received this season. The Golden Eagles looked sluggish in the early stages of the first half until a technical foul was called on Jaylen Butz as the Blue Demons held a 16-12 lead at the 9:22 mark in the first half. As Howard drained the first technical free throw, the DePaul bench would be assessed a technical, which meant Howard would have four tries from the charity stripe and delivered. The free throws provided a spark for Marquette on offense as it closed the first half on a 19-6 run as DePaul went into the half down 40-27. Fresh off a six-point win at Seton Hall on Jan. 19, DePaul coach Dave Leitao knew it would be difficult to follow up on the high-scoring affair, but expected a better effort. Despite struggling to gain a consistent grasp in the first half, Paul Reed scored 13 of 18 points in the second half in defeat, while Femi Olujobi finished with 15 points, on 8-of-10 from the foul line. Leitao wanted to see more of a balanced effort out of Reed and Olujobi, but knows better days are ahead for the frontcourt duo. For the second straight game, reigning Big East Player of the Week Sam Hauser would be an early non-factor on Marquette’s offense going scoreless for at least the first 13 minutes without a point. Hauser came alive once more as he scored the next eight MU points and finished with 19 points, on 6-of-11 shooting, while Joey Hauser finished with 14 points and six rebounds. Imagine more consistent performances from start to finish from Sam Hauser, to go along with Howard’s play and John’s assertiveness in the paint. If they can all come together, then the Golden Eagles could be a dark horse Final Four contender come the month of March.